Here’s my review for Saranc’s Caramel Porter. I liked it more than most BA reviewers. Poured from a chilly bottle into a pint glass. The beer has a dark brown color with some hints of ruby in it. There is a thick head of light brown bubbles. There is a little bit of lacing, but not much. It’s too dark of a beer to see if there is any carbonation rising within. The aroma is a good mixture of roasted malts and caramel sweetness. The beer has a very strong caramel flavor, it overpowers almost everything else. It’s not like a caramel malt, but more like the center of a piece of candy. It’s a bit surprising, but enjoyable. The caramel hits you as soon as the beer touches your tongue and lasts until you swallow. Near the finish is a bit of toasted malt sweetness that is distinctly separate from the caramel flavor. All of the sweetness contributes to a tangible film that coats your mouth. There is a lot of carbonation that you can feel on your tongue. Having one of these beers is enjoyable; it would pair especially well with some chocolates. More than one may be a bit difficult; the high levels of sweetness and the thick mouthcoating would grow tiresome. If you’re like me and are constantly seeking out the interesting beers available in Portland, you’ve probably heard about what happened at the Great Lost Bear over the past two Thursdays. 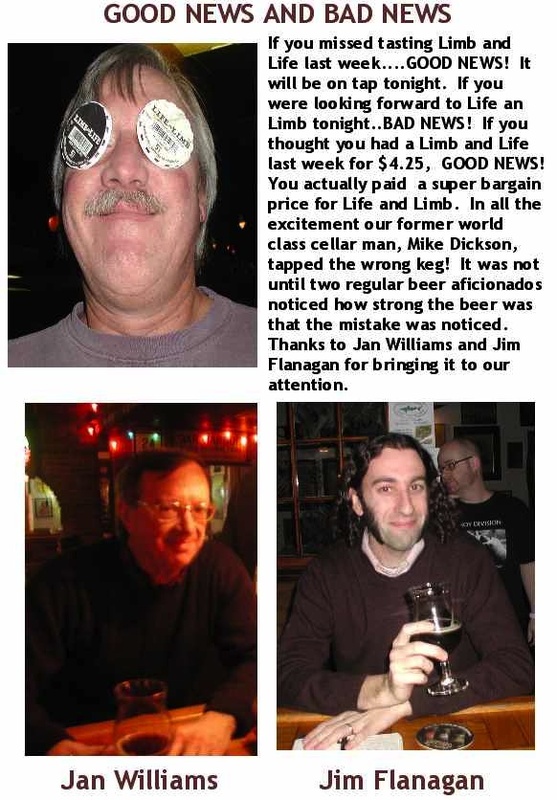 On January 7, the Bear advertised that they would have the Dogfish Head/Sierra Nevada collaboration small beer Limb & Life, followed by a keg of Life & Limb on the 14th. What happened was that the wrong keg was tapped, so that Life & Limb was poured on the 7th and Limb & Life on the 14th. I was one of the few people who suspected that there was something amiss on the 7th, as what I ordered certainly didn’t taste like a small beer (although it was better than the first glass of Life & Limb I had, in December at Novare’s Beer Geek Christmas). Unfortuantely for me, I was unable to attend the event on the 14th to get to try the Limb & Life, so my search for that elusive beer must continue. Don’t feel too bad for me though, I missed it because I was flying home from a 4 night cruise to the Bahamas. I found a nice surprise in my in box when I returned. In the weekly Bear’s Growl (the Great Lost Bear’s newsletter) explaining the mix-up, I was featured as one of the folks who brought the mistake to light. I also got quite a nice compliment thrown in for good measure. Thanks GLB! I won’t be making it to the Bear for tonight’s Harpoon showcase (although I’d love to have a Celtic ale, I missed out on it last year), as I want to attend the Pitch the Pint (aka Grab the Goblet) event at the Lion’s Pride. If you’d like to subscribe to the Bear’s Growl, sign up here. Luigi relaxing in his favorite chair/water dish. Two years ago today, Nissa and I took a drive to H.A.R.T. in Cumberland and came home with a new friend. Luigi was a stray found on the streets of Lewiston who had been living at the shelter since September. When we met him, one of the volunteers opened up the binder with all of the cats listed in it, and Luigi walked over and sat on it. We decided that this outgoing young man was the guy for us! The vet estimated his age to be between 1 and 2 years, as his actual birthday is unknown. So today, we celebrate his 3-4 year birthday. 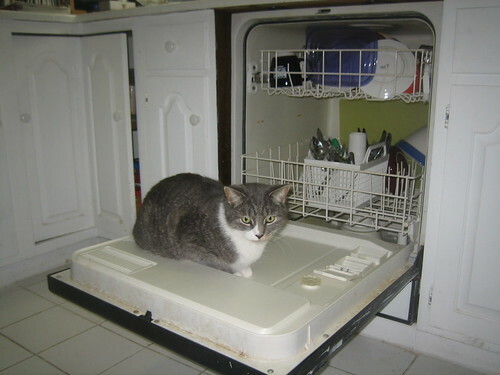 As a special treat, he’ll get some extra food for dinner, and probably a saucer or two of skim milk. Adopting shelter cats has been one of the most rewarding things we have done; I highly recommend that anyone with a little extra love to give consider adopting a cat. I’ve reviewed at least ten beers over at Beer Advocate since the last time I shared a review on this site. You can catch up with all of my reviews here. Here are three highlights from the recent batch. Reviewed from my notes. Enjoyed on 12.30.09 in my Uprising Chalice at Novare Res. Dark red/ruby color. Thick tan foam. Yeast and grassy hop aroma. Some toffee sweetness up front. Mild dry hop bitterness in the finish and in the aftertaste. Some alcohol, but not as much as I’d expect from a 10.8& ABV. Fuller body. More carbonation than I expected. I’ll enjoy this generous pour for a while, but I don’t think I’d order more than one in a row. It’s very drinkable, but I don’t want to over do it. Served from a cellar temperature 22oz bottle, split between two pint glasses. It has a translucent golden orange color, with a pretty head of pure white foam. It leaves some good lacing on the glass. The aroma is all hops, both citrusy and woodsy. As you would expect, the flavor is also dominated by the hop character. It starts out dry, then builds to sharp bitterness that lingers on after you swallow. You can detect some alcohol, especially in the finish and aftertaste. There are flavors that remind me of fruit and forests. This is as good as an IPA can get. It has a medium body and a higher-than-average amount of carbonation. It leaves a coating to your mouth that evaporates while you let the bitter flavors linger. This is an impressively drinkable IPA. There are hops everywhere, but I never grow tired of them. I wish I had more than this one bottle. Poured from a cellar temperature bottle into a pint glass. The beer is a translucent dark brown, nearly black, with hardly any light penetrating it. There was a huge head of brown foam. As it dissipated, it left some impressive lacing. There is a hearty malt aroma with a hint of pine hops. The flavor reminds me of a great porter. There are some toasted caramel malt flavors and a smooth finish with just a touch of hop bitterness. It has a body lighter than the color would lead you to believe. There is plenty of carbonation. The beer is highly drinkable; I could keep drinking it all night, the only things stopping me are the price and my desire to hang on to some bottles to cellar for a year or two.